Clifton Forge, VA (April 5, 2019) - After many years as an educator - teaching on three continents - Suzanne Ryan decided she was ready for a career change. 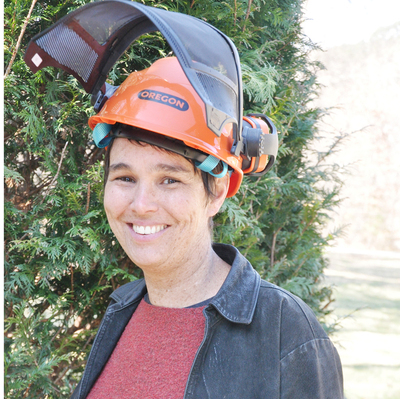 At age 47, the Charlottesville resident found exactly what she was looking for at Dabney S. Lancaster Community College: she is a first year student in the Forest Management Technology program at DSLCC. "I love it, it’s pretty wonderful," she laughs, taking a break from practicing with fellow students for a Woodsman’s competition in North Carolina. "I’m having a great time." Scott Reigel, who heads the DSLCC forestry program, notes that while first-year students take general education and foundational courses, the second year includes courses that are heavier on the science and environmental aspects of forestry. Ryan, who has a bachelor’s degree in Biology, has a particular interest in botany as well as environmental studies. After attending a workshop on silvopasture (the practice of integrating trees, forage, and the grazing of domesticated animals in the forest), Ryan started researching what sorts of forestry programs were available in Virginia. DSLCC, she discovered, offers a two-year associate degree in Forest Management Technology that is recognized by the Society of American Foresters. With an advanced degree under her belt – Ryan also has a master’s degree in Elementary Education – the academic portion of the DSLCC forestry program hasn’t been nearly as much of a challenge as the physical part. Ryan has been learning, along with the rest of the class, to wield an axe and a saw as well as climb trees. She says she’s operated a chainsaw before, and is looking forward to that learning session, too. Ryan has had an interesting career in education: she taught English in China; was a teacher in the New York City public school system and in two Waldorf schools, which are members of an international independent school movement; and also trained teachers in Sierra Leone, in Africa. Ryan recently was awarded a prestigious and generous scholarship of $3,000 from the Appalachian Vegetation Management Association, an organization of utility companies that meet once a month to discuss topics relative to their sector, explains Reigel. These companies deal in managing the vegetation health and risks along public service rights of way for the protections of those services. The scholarships are presented to encourage and give support to natural resource students in the pursuit of a career understanding, managing and treating the vegetative health and risks on these necessary public service routes within the Appalachian mountain range. The AVMA scholarships originally were open only to Glenville State College and West Virginia University, noted Reigel, but last year the AVMA expanded the scholarship opportunity to include DSLCC and Hocking College in Ohio, resulting in 36 applicants. "This makes Suzanne's award even more prestigious and we are very proud of her," he said. Ryan was honored at the group’s annual conference on March 20 at the Stonewall Jackson Resort in Roanoke, WV. The scholarship is named after Dr. Kenneth Carvell, Professor Emeritus of Forestry at West Virginia University. As for her next career move with a degree in forestry, which she plans to earn by 2020, she says she has been surprised by the number of opportunities available, from state agencies to private companies. She's weighing her options; she hopes to land an internship for the summer. For more information about the DSLCC Forest Management Technology program, contact Reigel at (540) 863-2894 or rreigel@dslcc.edu.